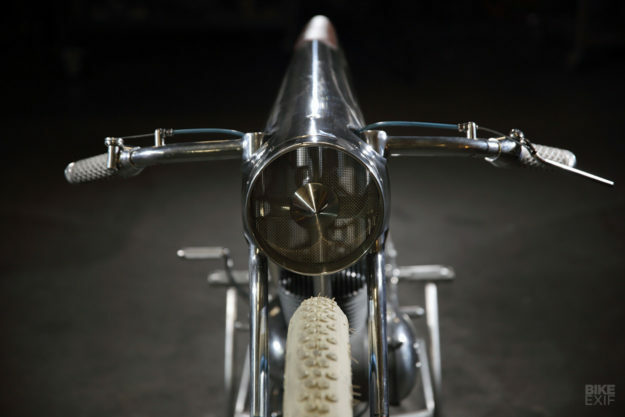 Motorcycle collectors are the unsung heroes of the custom scene. Most keep a low profile, but they all provide an essential service: they give builders artistic freedom and financial support, helping them to weather the inevitable ebb and flow of cash and customer demand. 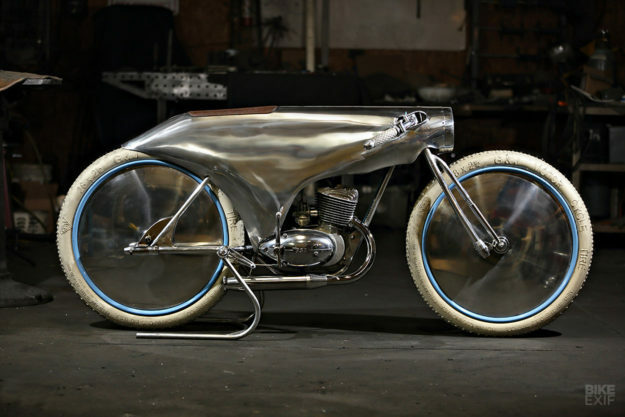 Dallas-based Bobby Haas is one of the most prolific supporters of bike builders in the USA. 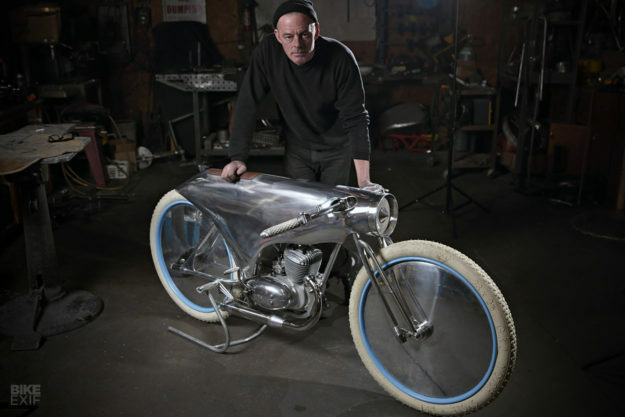 And he’s happy to share his passion with the public: on Wednesday 11 April, he’ll open the 20,000 square-foot Haas Moto Museum, with 110 vintage and custom motorcycles on display. 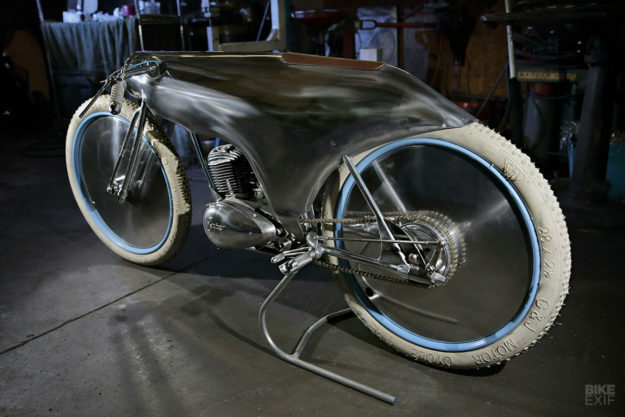 The latest addition to Haas’ collection is this extraordinary piece of motorcycle art by Craig Rodsmith. 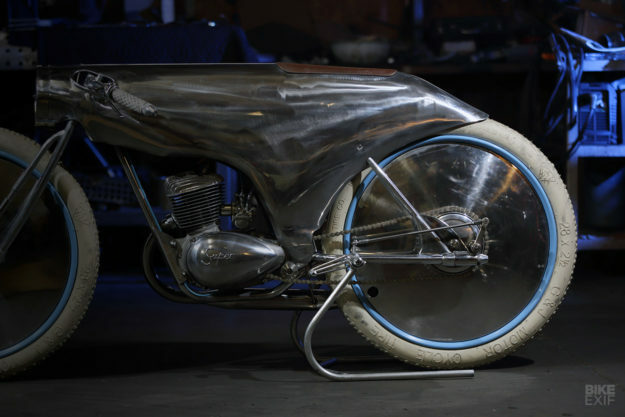 Haas already owns Rodsmith’s turbocharged Moto Guzzi dustbin fairing bike—“The Ambassador”—along with machines from Bike EXIF regulars Max Hazan, Revival Cycles, Alex Earle, Fuller Moto, LC Fabrications and Deus. “At the 2017 Handbuilt Show in Austin, I immediately fell in love with Craig’s magnificent Moto Guzzi, and shook hands on that purchase a few hours after meeting Craig,” Bobby tells us. 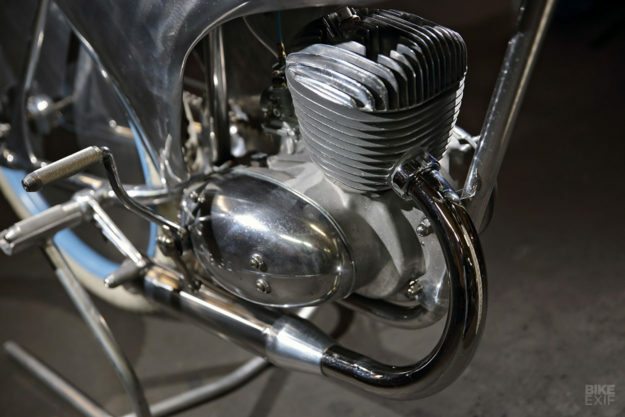 The engine is a mid-1950s BSA Bantam 150 two stroke. Craig got it from a local guy, Ed Zender, who specializes in parts for English bikes. 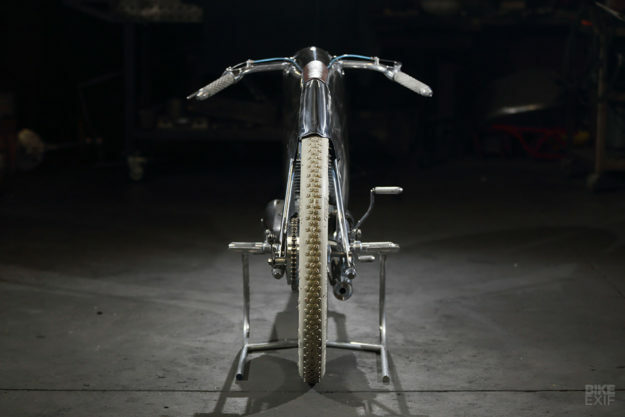 Craig is truly a master of metallurgy, and after hand building the frame he fashioned the bodywork from aluminum—with a very cool front ‘intake’ incorporating a stainless mesh screen. The handlebars protrude though the bodywork, with cutouts to allow a decent range of movement. It’s the whole ‘super sano’ concept taken to the extreme. 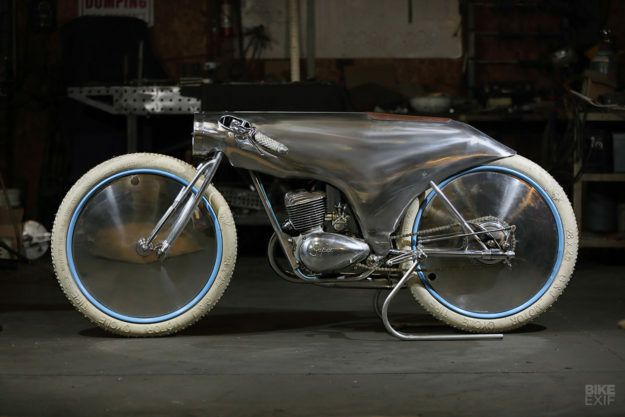 The starting point for this BSA, though, was the wheels. And getting them to work was a taxing exercise even for someone of Craig’s skill level. 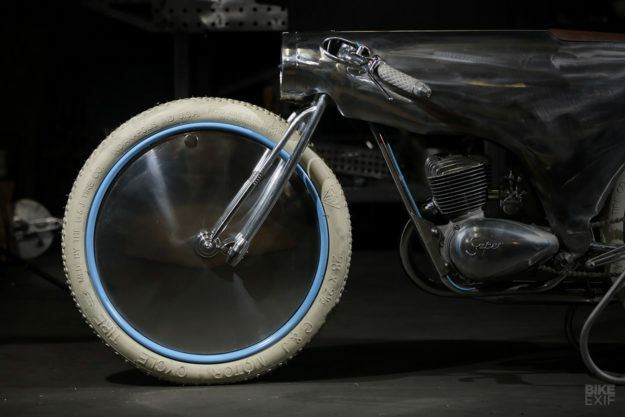 “I made the wheels from scratch, I machined a pair of hubs from aluminum, then cut two discs for each wheel and made a makeshift press to dish them as I annealed [heated to soften] the aluminum,” he explains. 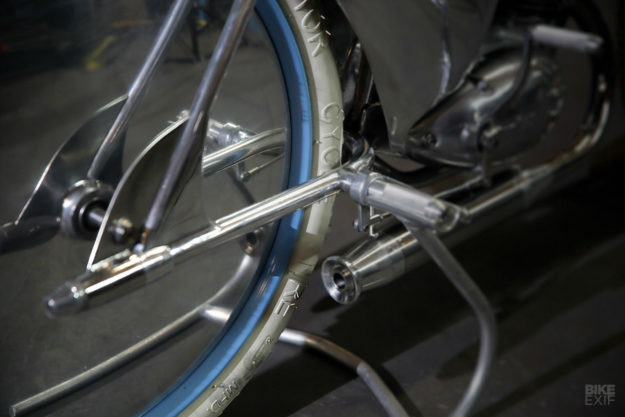 Then Craig mounted an outer steel ‘clincher’ rim by bolting it to the hoops from the inside, where the tube runs. But fitting the white natural rubber Coker tires turned into a nightmare. The clincher tires kept popping off the rim. The brake system was mercifully much simpler: there’s just one anchor, on the rear. Craig made the drum with an integrated sprocket and a modified BSA backing plate for the calipers. The engineering is sleek, precise and polished, and so are the aesthetics. Granted, this is not a bike you’d ride to work, or even to get the groceries. It doesn’t have ABS or traction control and it won’t charge your phone while you’re on board. But it’s a reminder that traditional skills are still out there, along with blue sky thinking, English wheels, and good old-fashioned lathes. And for that, we should be thankful. 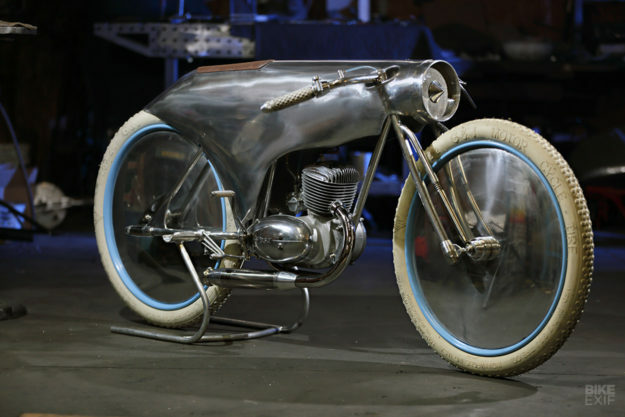 If you’re in the vicinity of Dallas any time soon, head over to the Haas Moto Museum for proof that old-school craftsmanship is alive and well.